Baking Spritz Cookies with a Cookie Press gives a uniformity unmatched by most other baking methods. This traditional cardamon spiced Christmas cookie can be made in many shapes– flowers, wreaths, or trees– and left plain or decorated with icing. Your holiday baking (or eating!) might not be complete without these traditional Spritz cookies. 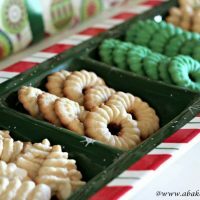 This is my first year making the buttery cookies and I am hooked! A kind friend brought me a beautiful plate of Spritz cookies last Christmas. I was so touched by her thoughtfulness that I wanted to pass on that same holiday cheer this year. While you could use a pastry bag and star icing tip to get a similar effect, the cookie press gadget is the key to these precisely shaped cookies. From flowers to hearts to pumpkins to butterflies, these shapes are going to be used year-round. Buy the cookie press for less than $20 and you’ll have years of baking Spritz cookies ahead of you. I tried the basic vanilla cookie dough recipe and the surprise ingredient, for me anyway, was cardamom. I didn’t have that spice in my pantry and was curious to try it. What a delicate difference it makes! You can decorate the cookies with sprinkles, add food coloring to the dough, or ice them once cooled, but they are just as pretty plain. The cookie press makes fast work of the process and you can even switch shapes as you go. And if you think making these cookies is a breeze, eating them is even easier! 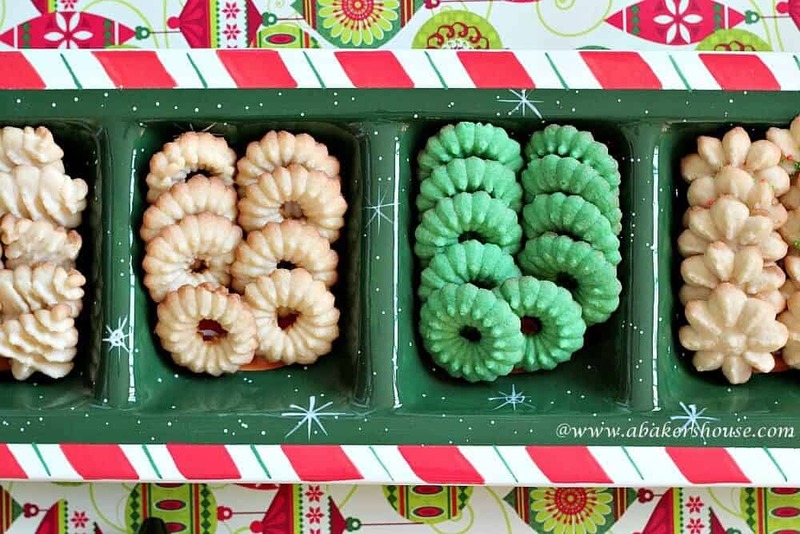 Make a batch of these festive cookies to share with friends and family this season! Bake for 10-12 minutes then cool on a rack. This recipe can be found in the Kuhn Rikon company’s Cookie Press Instruction booklet. Do not refrigerate this dough before using the cookie press. The dough doesn't react to the press nearly as well if it is cold. I linked up to this page from South Your Mouth and to Southern Plate to share my post. What a great collection of recipes! These cookies are so beautiful! Lovely. 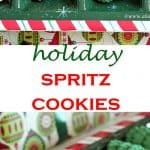 I adore spritz cookies but I’ve never made them from scratch. Now I may just have to! Thanks, Kate! These are deceptively simple. I may try to decorate them a bit more next time for a change. I bet they’re delicious too. You wouldn’t believe how quickly these are disappearing! Luckily another batch is easy to whip up so there will be plenty more to share. So pretty! 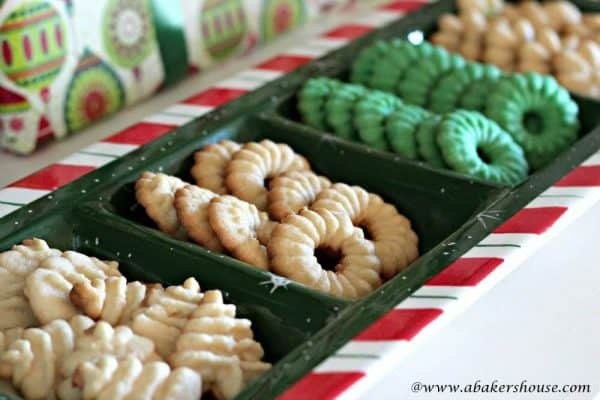 I just might have to dust off the old cookie press and make a batch of these. I know making cookies isn’t your favorite but that cookie press would make quick work of a few dozen. The only trouble for me is that I then eat a few dozen myself!! I have been making Spritz cookies for the holidays since I was a young girl…I’ve lost count of the number of cookie presses I’ve gone through! But they never fail to bring a cheerful element to our cookie tray and I never fail to eat too many of their cute buttery goodness! I think there is a short learning curve with the press– it took me a few minutes to work out a good method and after that it was like a cookie factory in my kitchen! I bet your girls have happy memories of holidays filled with goodies like these. Love, love, love spritz- it’s tradition in my family to make these every year. However we don’t use cardamom- we add like a 1/4 teaspoon of almond extract, it makes all the difference! Great post, the cookies look perfect! I’ll have to give almond extract a try, I have some in the pantry. Thanks!